Mom was the best baker and her cannoli tarts were the perfect substitute when we had company. 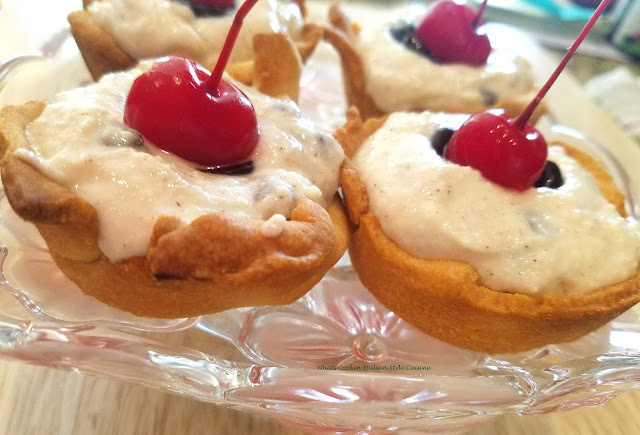 You can prepare these quick cannoli tarts that still has the same great taste. The cups are baked not fried! A Perfect Dessert When Your A Cannoli Lover for a quicker version!! Tired of making shells from scratch , here's a quick fix to your cannoli craving. I thought hmmm, lets experient on a cannoli baked, still with a great taste of marsala dough and in a tart form. So I decided to try this in cupcake tins, used mom's favorite pie crust recipe (Click Here). Then to get a good flavor on the dough, I brushed the molded tart crusts with a mixture of butter and marsala wine. Used the same recipe to fill with a cannoli filling and viola! These were quick easy and delicious! You can make the shells ahead of time and just fill them later too when needed! How fun to be able to serve these at a shower, wedding reception or gathering. Take a zip lock (above photo), fill the bag, snip the end off of the bag and pipe the filling in the tart. Make dough. Spray each cupcake tart in your pan with cooking spray, lightly coating. Take a small piece of dough to fit the size of each cupcake tin, rolling out around 1/4 inch thick. Use a fork to poke holes on the bottom of each cupcake tart. 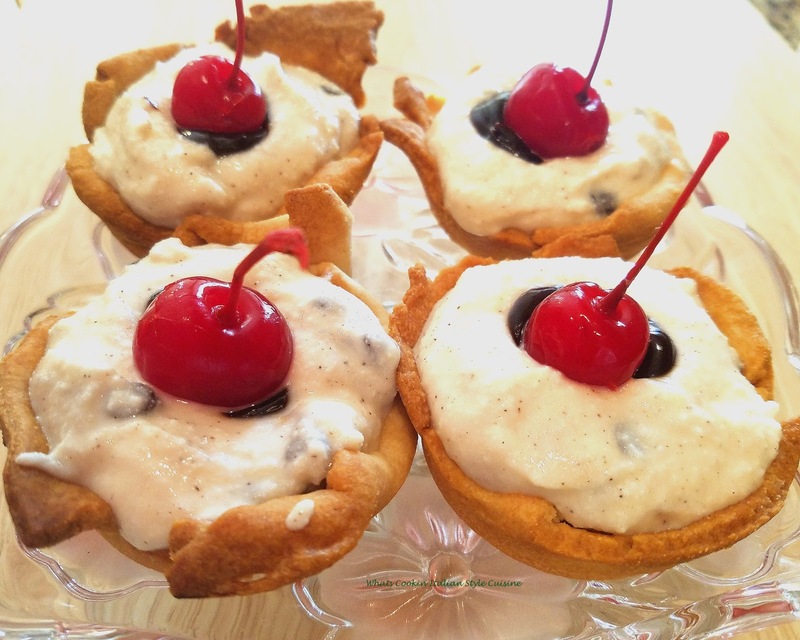 Brush each cannoli tart with mixture of butter and Marsala. Bake crust until golden brown, around 20 minutes. Cool completely. When cool, fill with cannoli filling below. Mix all together and refrigerate at least two hours. In the meantime. Dip each tart rim in melted chocolate place on wax paper to dry. Fill each cooked tart shell. To our surprise on my first try, these were fantastic substitutes for cannoli pastry! If you have leftovers refrigerate them. I was looking for cannoli recipe there, but like it with pie shell. Wow, marsala dough...now that sounds like a fabulous touch! You have wonderful ideas and these look delicious. It would be hard to stop at one. Just Awesome Claudia! My son would LOVE this. He is a huge cannoli fan! What a great dessert! Love the technique. I am going to have to make these, my wife loves Cannoli. I bet they would freeze well. These look fantastic! I would love these. I am a huge cannoli fan. Oh, genius! Sneaky, yet so gorgeous. Marsala dough - innovative. You are so smart, this is way easier than making cannoli shells! Thank you!! looks devourable and great.. just perfect..awesome recipe!! I love cannoli and these look stunning!! A Must try. Genius! I love cannoli, but don't have the patience (or those special metal tubes) to make them, but this is much easier and definitely a fun (and slightly healthier) alternative! Love it! I put Marsala in my shells so it stands to reason it is perfect in the pie crust. I love anything cannoli - so this will be squirrelled away for my next cannoli day! Of course, cannoli is an all time Italian dessert favorite of ours. The Brocatto Italian Ice Cream shop in NOLA makes them to order and some of the best in the city. Now these tarts! I will take a dozen of them to go please! Sublime dessert Claudia - more read more I want it! A wonderful idea! These are gorgeous and sound totally scrumptious! What scrumptious little treats Claudia! Wish I had one. Or two. Claudia these tarts look delicious. I like your creativity, your technique for filling the tarts was perfect!! What a wonderful idea for cannoli. Fantastic Idea! Love the baked shell idea! I do have a question...uncooked Tapioca? What does it do to the texture of the cream? Excellent idea! I love that you made these so simply! That looks incredibly tasty, and incredibly bad for my self control! ;) Genius twist! Claudia, You are both creative and resourceful. Thank you for sharing the recipe, I'm looking forward to giving them a try! Omg these are flipping incredible. You really blew my mind here. I must make these. Super buzzing this one. Lol! I love this idea! They look fabulous! Great idea to revamp a cannoli recipe! Beautiful tarts Claudia. I love cannoli's so much! these look fantastic. Such an easy alternate to the traditional cannoli! They look amazing!